As a juvenile they said he belonged in prison. Afterwards he didn't belong anywhere. What do a thief, kidnapper, two murderers and a heroin addict have in common with your child, brother, father? Take away the labels and you'll find these imprisoned teenagers are an awful lot like people you know. 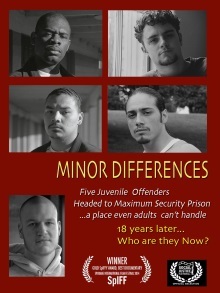 MINOR DIFFERENCES introduces five juvenile offenders in maximum security lock-up. We meet them again 18 years later. Filmmaker Heather Dew Oaksen did not set out to establish long-term relationships with these jailed teens. But they won her heart and she won their trust. 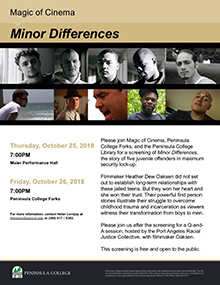 Their powerful first person stories illustrate their struggle to overcome childhood trauma and incarceration as we witness their transformation from boys to men.